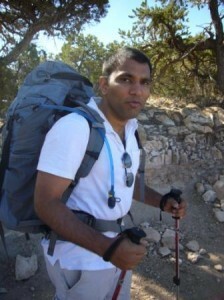 I am Amit, currently living in Durham, NC. I was born in Kanpur, India in 1977, where I spent my early childhood. Most of my schooling years were spent in Udaipur at a boarding school. In Udaipur I made a lot of friends, played a lot of football, became self reliant, arrogant, and walked out a naive young man. I realized I was good in academics – at least when I paid attention – average in football, and artistically challenged, the only thing I had going for me was my enthusiasm for whatever I picked. I enrolled for electrical engineering at Nagpur University, and hardly paid any attention to it. Most of it was easy and I was attracted to a lot of things outside of college. I had my share of beers, chased girls, bunked classes, read the ‘Bhagvad Gita’, learned yoga, picked up fights, and rode my father’s decrepit Vespa to all corners of India. Four years quickly rolled by and I was left with decent grades and an average education. I toiled towards the end, got lucky, and started my career as a software engineer at Infosys Technologies. The best thing I got from my first job – my Yamaha Rx 135. There were not many weekends when I did not explore places in and around Bangalore on it. And as exciting as Bangalore was, Infosys did not live up to my expectations. Finally ambition caught up with me. In a year I grew out of the childish notion that I would somehow be unpatriotic to leave India to better my education and career. In fall of 2001, I arrived in North Carolina, America, to learn Computer Networking. America was a revelation; they say people travel to India to find their self, for me it was the other way round. I met my wife, Divya, and found my career path (the exciting world of tech startups) here. I currently work at CData Software where I am fortunate to be surrounded with an enterprising team of engineers, marketers and business people. Our products ease some of the challenges in the new world of cloud based systems and big data. When I am not working, I am learning something new from my son Vivek and daughter Vidya. We enjoy exploring the natural beauty of southeast America and are a big fan of North Carolina mountains and beaches. These days i am not seeing any new articles in your website, what’s up buddy. Working on some classified project.